Guatemala, belligerent bully, stops SATIIM on Sarstoon! BELIZE CITY, Thurs. Apr. 7, 2016–“Is there a new international directive for traveling in the Sarstoon River?” That was the question posed by the Sarstoon Institute for Indigenous Management (SATIIM) in a statement released on Wednesday afternoon, when the NGO reported aggressive acts by Guatemalan military which demanded that their patrol reports to them first before venturing into the Sarstoon River—part of which is Belizean territory, from the northern bank up to the mid-channel. “The Guatemalan military informed SATIIM on Tuesday, April 5th 2016 that all visits to the Sarstoon must be reported to them. This is a new break/chapter in park monitoring by SATIIM,” the NGO said. Froyla Tzalam, SATIIM Executive Director, told Amandala that she does not want to appear to be anti-government, but the organization, under the advice of Maya leaders, had expressed that the co-management agreement proposed by the Government was not in the community’s best interest, so they did not accept. On Wednesday morning, before SATIIM reported on its Sarstoon encounter, Amandala had asked Deputy Prime Minister Gaspar Vega, the minister responsible for forestry and fisheries, about the policing of illegal activities in southern Belizean, and we also brought up the fact that the breakdown of the co-management agreement between the Government and SATIIM had left a void in the area. Tzalam said that SATIIM patrols have been infrequent. They would also have been at the Sarstoon last year February when the Guatemalan Armed Forces (GAF) detained a boatful of Belizeans, claiming that they had drifted into Guatemalan territory. However, the SATIIM patrol was not dispatched and so did not cross paths then with the GAF. Subsequent attempts in 2015 to dispatch patrols also did not work out, but SATIIM returned to conduct monitoring this February, albeit without incident from GAF. It ventured out again this week. We understand that there were 8 persons on the Belizean boat which left Punta Gorda on Monday, including the captain, a former SATIIM ranger, two Crique Sarco leaders, one of them a former alcalde who is now a board member of SATIIM, and the current alcalde of that village. The men watched as the Guatemalan military boat sped across Belizean waters. A member of the SATIIM patrol, speaking on condition of anonymity, gave us a firsthand account of what happened. He told us that they had gone to document illegal activities at Black Creek, and very soon after they exited the tributary, located about 6 kilometers from the mouth of the Sarstoon, they noticed the Guatemalan military. The patrol member said that he had been taking photos of the area when the military emerged, as if lay-waiting them, and so he decided to turn off his camera. The incident, he told us, unfolded at about 12:10 p.m. on Tuesday, April 5. “First of all, we did not even realize they were soldiers at the bank of the Sarstoon River,” said the patrol member. At first, the Guatemalans were on their side of the river, but he said that they sped up the boat, crossed over to the Belize side and almost sandwiched them close to the river bank. “We were surprised. Then we realized that it’s the Guatemalan military and the boat is just like the BDF boat,” he recounted. “In a split second, things changed,” he said, adding that the Guatemalan military put on two blue headlights and blasted its siren. “I said, ‘Guys, it looks like we will get arrested today again!’” said the patrol member, who had been on the expedition led by the Belize Territorial Volunteers in 2015, which had similarly been intercepted by the Guatemalans. The patrol member continued recounting what happened: “…the boat started coming downstream. Our captain said, ‘Put down the camera. I don’t want to start any trouble from our side… Within a minute, they speeded down to our boat. Our captain, he stopped and that is when the boat started drifting into the left side of Belizean waters; their boat came as if to sandwich it. They bucked into the boat. “One of them [a Guatemalan] had a Go Pro camera mounted on his chest; he was videotaping everything and then another soldier was taking photographs continuously throughout the time when we had the encounter, the engagement. And then our captain went on to say that we went to the BDF and have checked in with the Belize military; however, two of the Guatemalan officers—there were 8 on the boat—maintained their demand, that SATIIM must go to the Guatemalans at their military base and inform them when using the river – both when entering and when exiting”. Their base, said the patrol member, is located on the southern bank of the Sarstoon, about 500 meters away from the Belize Defence Force’s forward operating base, under construction. “I was nervous. You could never underestimate what they have in their mind and what they could do to us. We were the only ones in that river. No one else,” said the patrol member. “They said there is a new protocol… We have to check in when we enter and exit and there would no problems, because the Sarstoon River is for Guatemala,” he said the Guatemalans told him. The patrol member told us that although the Guatemalan military never boarded the Belize vessel, the Guatemalan military was definitely inside Belizean waters when they came to speak with SATIIM crew. The Guatemalans left after making their demands, but wrote down the names of the boat captain and the other members of the SATIIM patrol. The SATIIM patrol—which was intercepted after completing the mission at Black Creek—did not accede to the demand of the Guatemalans. In its statement to the press on Wednesday, SATIIM called on the Ministry of Foreign Affairs to clarify the situation for Belizeans using the Sarstoon River. Chief Executive Officer in the Ministry of Foreign Affairs, Lawrence Sylvestre, told Amandala that he had received a letter from Tzalam, detailing what the SATIIM team encountered and he acknowledged receipt last night. When we asked the CEO about the Government’s response to what has transpired, Sylvestre said, “we are dealing with the matter,” but declined to indicate how exactly they are doing this, citing confidentiality under confidence building measures between Belize and Guatemala, which, by the way, do not cover the Sarstoon border. We also asked the CEO about the claim made by the Guatemalan military to the SATIIM patrol, that Belizeans using the river must go over to their side to report their activities to them. “I don’t know why they are saying that,” he added. We tried again to probe him on what the Government would do to “deal with” what transpired this week on the Sarstoon, and again, the CEO was firm in not disclosing any particulars, but maintaining his line that “we are dealing with the matter” in the same way as they have when “they receive reports of such an incident…” and that assurance, said Sylvestre, was given to SATIIM. We asked the CEO about proposals for confidence building measures to cover the Sarstoon and he told us that we would probably get an update very early next week, as they are planning on following up on the commitments given at the March 15, 2016 meeting which Belize and Guatemala had at the headquarters of the Organization of American States in Washington, DC. That meeting came on the heels of assertions by the Government of Belize that tensions between Belizean and Guatemalan military had reached an all-time high after encounters in the days leading up to that pre-planned Washington meeting. “The GAF approached the FOB, though they never actually attempted to come on to our land, and behaved in an extremely hostile and threatening manner, insisting that our troops should not be at the Sarstoon. The Belize Forces stood their ground and after some time the GAF withdrew,” the Government of Belize reported. Eight to nine years ago, in October 2007, SATIIM’s patrol had a similar encounter. 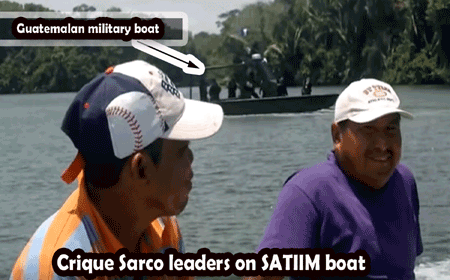 In our news report of the incident, it had been reported that SATIIM’s group, which consisted of about twelve people, including a police officer from Barranco in plain clothes, was on the Belize side traveling westward up the river in their 26-foot skiff when they were accosted by five Guatemalans in a Guatemalan Navy gunboat. The report stated, “The Guatemalan party, which included three armed men, a captain, and an officer in charge, demanded to know where the Belize party was going and asked them to produce their passports, captain’s license, and papers for the vessel they were traveling in…. “The southern border of the park is the Sarstoon River and the easiest way of patrolling it is via the Sarstoon River,” the NGO said. The NGO highlights the problems that have emerged because of inadequate surveillance in the area: “There is little doubt that unless areas are monitored, illegal activity takes place, destroying this fragile, ecosystem,” said Tzalam, SATIIM’s Executive Director. The NGO says that it has documented fishing and logging camps along the Temash and Sarstoon Rivers set up by non-Belizeans. Tzalam echoed concerns raised years ago by SATIIM’s former executive director, Greg Ch’oc, that opening up seismic and oil exploration trails in the park would inevitably make it easier for Guatemalans to access the park to illegally remove its natural resources, such as timber. “In addition, hundreds of acres of sphagnum moss were burnt, most likely as the result of a camp fire,” said SATIIM. Why be concerned? SATIIM notes that the STNP has the largest concentration of Sphagnum moss in Central America. “The patrol also reported that numerous skiffs were heard travelling in the area for unknown purposes but it is likely that they are not Belizeans fishing at night,” the NGO said. “While the Belize government unilaterally ended SATIIM’s co-management agreement in the Sarstoon Temash National Park, community patrols have continued to report increased activity as a result of the large paths blasted through the park for oil exploration,” the NGO said. “These paths established easy access from the Sarstoon River, straight through previously virgin areas. Alarmed with the increasing environmental damage, SATIIM continues to work with Mayan communities to monitor and document the damage in an otherwise neglected protected area,” the NGO told the press. Although on the official front, the Government of Belize has been saying for some time that they have been speaking with the Guatemalans on the diplomatic front about the incursions, Guatemala’s adamant and threatening posture on the Sarstoon has remained unchanged.